Sorghum (Sorghum bicolor (L.) Moench) the world’s fifth most important cereal crop, grown throughout the arid and semi arid tropics. Sorghum is a vigorous grass that varies between 0.5 - 5.0 m in height. It is usually an annual. It produces one or many tillers, which emerge initially from the base and later from stem nodes. The root system consists of fibrous adventitious roots that emerge from the lowest nodes of the stem, below and immediately above ground level. Roots are normally concentrated in the top 0.9 m of soil but may extend to twice that depth and can extend to 1.5 m in lateral spread. The stem is solid, usually erect. Its center can be dry or juicy, insipid or sweet to taste. The center of the stem can become pithy with spaces. Leaves vary in number from 7 - 24, depending on the cultivar. They are borne alternately in two ranks. Leaf sheaths vary in length between 15 - 35 cm and encircle the stem with their margins overlapping. The leaf sheath often has a waxy bloom. Leaves are from 30 - 135 cm long and 1.5 - 13 cm wide, with a flat or wavy margins. Midribs are white or yellow in dry pithy cultivars or green in juicy cultivars. The flower is a panicle, usually erect, but sometimes recurved to form a goose neck. The panicle has a central rachis, with short or long primary, secondary and sometimes tertiary branches, which bear groups of spikelets. The length and closeness of the panicle branches determine panicle shape, which varies from densely packed conical or oval to spreading and lax. Grain is usually partially covered by glumes. The seed is rounded and bluntly pointed, from 4 - 8 mm in diameter and varying in size, shape and color with cultivar. Sorghum originated in the north-eastern quadrant of Africa, where the greatest variability in wild and cultivated species is found to this day. It was probably domesticated in Ethiopia by selection from wild sorghum between 5,000 and 7,000 years ago. From this center of origin, it was distributed along trade and shipping routes throughout Africa, and through the Middle East to India at least 3,000 years ago. It reached China along the silk route. Sorghum was first taken to the Americas through the slave trade from West Africa. It was reintroduced in late 19th century for commercial cultivation and has subsequently been introduced into South America and Australia. 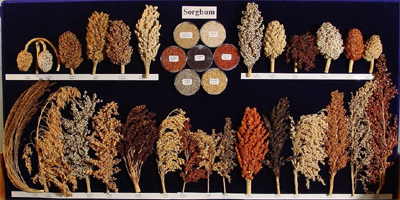 Sorghum is now widely found the drier areas of Africa, Asia, the Americas and Australia. Sorghum is adapted to a wide range of environmental conditions but is particularly adapted to drought. It has a number of morphological and physiological characteristics that contribute to its adaptation to dry conditions, including an extensive root system, waxy bloom on the leaves that reduces water loss, and the ability to stop growth in periods of drought and resume it again when conditions become favorable. It is also tolerant to waterlogging and can be grown in high rainfall areas. It is, however, primarily a crop of hot, semi-arid tropical environments with 400 - 600 mm rainfall that are too dry for maize. It is also widely grown in temperate regions and at altitudes of up to 2300 m in the tropics. Sorghum can be grown successfully grown on a wide range of soil types. It is well suited to heavy Vertisols found commonly in the tropics, where its tolerance to waterlogging is often required, but is equally suited to light sandy soils. It tolerates a range of soil pH from 5.0 - 8.5 and is more tolerant to salinity than maize. It is adapted to poor soils and can produce grain on soils where many other crops would fail. Click here for Taxonomic classification of Sorghum sps. © 2018 - ICRISAT Regional Genebank, Nairobi.